Dark Times 11 – 1996 – Part 6 – Obi-Wandi, a retrogaming retrographer. Insatiable fans were understandably frustrated by their inability to alter time, speed up the harvest or teleport them off this galaxy. They found themselves inadvertently subjected to the terror of the natural flow of time. Shadows of the Empire surely operated as a proper ointment for the sores of trying patience, but harboured even more than multimedia entertainment of epic proportions because a wealth of details (Coruscant setting, swoop bikes, Rendar’s Outrider and more) pointed squarely at Lucasfilm’s next event that would fittingly address the very foundation of George Lucas’ priceless property. Foreshadowing the Prequel look: Though superficially insignificant to the overall franchise, the Swoop bikes are a text book case of creating a excitement and familiarity in equal measure: first seen in a computer game, then a toy and as a Special Edition addition – revealed already in the popular Trilogy Special Edition trailer – this vehicle would eventually become a sneak preview of Attack of the Clones, released an amazing 6 years after Shadows of the Empire. 20th Century Fox had approached Lucasfilm with distinct plans many years prior to the 20th anniversary of Star Wars. Both companies went about their tasks with loving devotion, in particular George Lucas and his legion of artists, who developed a voracious appetite for a galaxy far, far away. What had begun as a surgical improvement of a mere smattering of shots, grew ever more elaborate. ILM staffer John Berman remembers the transition vividly: ‘My first reaction […] was a predictable one – What? You’re messing with a masterpiece! – but as I came to understand the reasoning behind it, it was a wonderful opportunity to step into something you know and love, and enhance it’ (Star Wars Magazine, April / May 1997, p16). The first new Star Wars footage out of ILM’s cauldrons since 1987’s Star Tours ride (see LIFM #2) could not have come at a better time: contemporary competition, fuelled by the latest technological inventions, tempted and distracted new generations from the principal goal of Lucasfilm’s strident resuscitation efforts. The phenomenal reception of the epic Special Edition trailer confirmed ILM’s professional status as wizards from out of this world and proved the instincts of Tom Sherak, head of 20th Century Fox, quite right. The industry had closely followed Fox’s tip-toeing around lightsabers for some time, especially so since Steven Spielberg had brought to life with his pals David Geffen and John Katzenberg a brand-new studio, DreamWorks SKG. Many had understood that the new studio would be given the inside track on obtaining the valuable distribution rights for the upcoming Prequel trilogy. ‘Some question why Lucas would go to DreamWorks’, Variety’s Buzz column “DreamWorks has Eye on Dreamy Pic Deal” noted a year before. ‘[Lucas] could easily work through the Universal pipeline himself, as DreamWorks would do anyway’, Buzz continued, noting further that as ‘Lucas plans to finance the pics himself, and hang on to ownership of negatives […], the studio might not see a significant financial upside on the deal[. ]’ Buzz did underline, however, that ‘the boost [in] market share for three years would be desirable’, a boost that seemed much more within Sherak’s reach at the end of 1996 (Variety, August 7 – 13, 1995, p2). The Star Wars Special Edition tipped the balance in favour of Fox’s glaring searchlights again, prompting Variety’s Andrew Hindes to describe Tom Sherak’s hearty courting of King George rather fittingly as ‘something of an audition’ (Variety, Nov. 11 – 17, 1996, p1, 75). With only a few weeks until the launch of the digitally revamped ANH, the classic space saga faced its own audition in a strange twist of events. Some had begun venting a considerably sour attitude towards Lucas’ far away galaxy. Venerable fantasy bi-monthly Cinefantastique (CFQ) had taken a particularly critical stance. This late 1996 issue of CINEFANTASTIQUE dedicates its cover to the media phenomenon that the Star Wars Trilogy Special Edition would soon become. CFQ was founded in 1970 by the late physics scientist Frederick S. Clark, a science fiction enthusiast and avid genre observer ever since When Worlds Collide hit theatres in 1951. Under Clark’s supervision, and due to the long history of his exciting contributions, CFQ had emerged as a committed supporter of the science fiction and fantasy genres. High-brow motion pictures had naturally made the outside supra-reality of fantastic narratives seem like childish efforts compensating for vacuous storylines with sensational visuals. 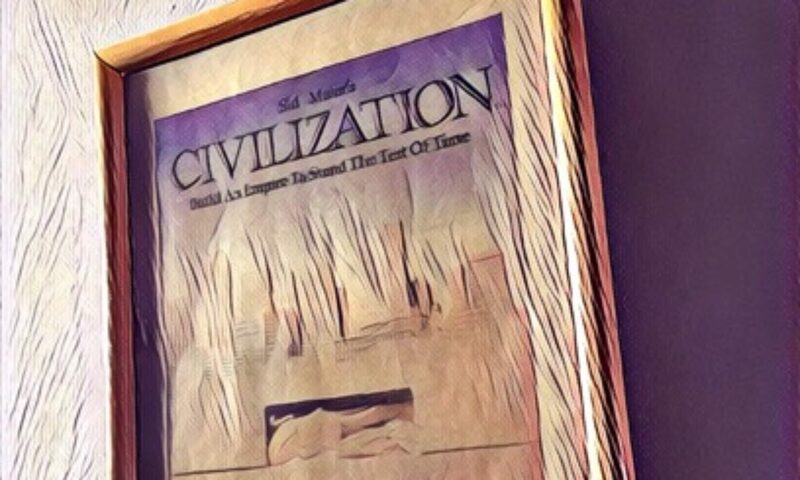 Yet the editors of CFQ carried the torch passed on by great writers such as H. G. Wells and Isaac Asimov, who had employed the theme of superior technical evolution to investigate the human situation. In selfsame manner, the periodical acknowledged the heightened excitement sci-fi fantasy inevitably added to the visual canvas of film as a viable creative asset. From the card-board entertainment of Flash Gordon or Gojira’s foam-rubber stomp, to indelible classics such as Andrei Tarkovsky’s Solaris and indeed Stanley Kubrick’s 2001: A Space Odessey, they all were discussed with the magazine’s signature academic vigour. With such a uniquely accessible profile to its credit, CFQ equally concerned itself with the artisans and their craftsmanship involved in bringing such complex, never before seen visions to life. Although Star Wars unquestionably could not hold its own against far more cerebral fare, its qualified spectacle sent shockwaves through the industry and revived the special effects community, which had languished in obscurity for ages, as Dennis Muren remembers: ‘These (‘Star Wars’) guys were spending tens of thousands of dollars on effects. I thought I should learn that technology’ (Variety, March 28 – April 4, 1994, p4). “An exposure meter?! ?” “This is the weapon of a cinematographer. Not as clumsy or random as a render engine. An elegant tool of a more analogue age.” The brilliant Dennis Muren made two significant career decisions in his life: first, Muren joined ILM, second, he took a sabbatical to master digital wizardy. CFQ equally took note of George Lucas’ space fantasy and lavished many issues on the surprise hit from outer space. In early 1996, Star Wars received an honourable mention from Susan Uram, who commendably reflects on the then still unseen Special Editions and the Prequels, ‘If Lucas has not exhausted his imagination on the first trilogy, we can hope that the new movies will create as big a disturbance as the originals. May the Force be with you still, Lucas’ (CFQ Vol. 27, No.6, p5). A few months later, the Saga’s characters prominently grazed the magazine in anticipation of the trilogy’s 20th anniversary. The actual underpinnings, however, were far from celebratory. Cinefantastique’s then West Coast editor Steve Biodrowski perceived Lucasfilm’s call to re-experience these classics loved by millions as a profoundly precipitous undertaking. In his editorial column of CFQ’s Star Wars 20th anniversary issue, he draws a comparison between Ridley Scott’s masterpiece Blade Runner and George Lucas’ space opera. Biodrowski supports Scott’s efforts to rework the original film because ‘it was always considered flawed, but STAR WARS is regarded as a classic – i.e. sacred and, therefore, inviolate’. The magazine’s editor doubts that Lucas seeks to ‘perfect his art’ and suggests that he simply pursues the Special Edition to fashion a ‘two-hour trailer for the next trilogy’. The journalist concludes dryly: ‘Frankly, no one who produced both WILLOW and HOWARD THE DUCK and handed the directing reins of RETURN OF THE JEDI to a hack like Richard Marquand, is a perfectionist’ (CFQ, No.8, p1). From J. W. Rinzler’s blog entry “An Interview and a Box”, August 9, 2012: Director Richard Marquand, Harrison Ford, visual effects supervisor Richard Edlund. Click for J.W. Rinzler’s full blog entry. The vitriolic charge increases seemingly with abandon in the preview section of the same issue. While ANH is slighted for not allowing audiences to truly go back in time due to the Special Edition accoutrements, TESB receives ridicule for lacking an ending (‘such niceties being deemed unnecessary when you want to make sure that the audience will fork over $7 more to see the sequel’) and ROTJ is harshly felled at the CFQ’s hands: ‘[W]e cannot help wishing there was some way for [Lucas] to fix everything […] that is wrong with this movie. The revisions would be so extensive […] that, except for a complete remake, it would probably be impossible to implement them all’ (CFQ, No. 8, p2). CFQ broadly accuses George Lucas of gleefully extorting filmgoers with a promise of grandeur and excitement that his cinematic abilities could allegedly never fulfil. Such an aggressive angle seems all the more alienating considering that no reference is made to the Special Edition trailer. It is further dubious to argue with a narrative structure that has been tried and tested for centuries and which Irvin Kershner put to great use in TESB. ROTJ, for all the flaws it may have, was too exciting and overwhelming when it first hit theatres to be handed the much-loved Worst-Film-For-All-Eternity Award. The magazine’s fixation on picturing George Lucas as a man of insatiable greed who carelessly handles a cultural, if, by Steve Biodrowski’s reasoning, incorrigibly flawed legacy, is a troubling aspect that provides the underlying tone of Lawrence French’s CFQ cover story on the 20th anniversary reissue of Star Wars. Lawrence French’s waning faith in the Saga creates a dichotomous marriage of excitement and uncertainty over what to expect. As with many articles guessing the nature of future events, French’s piece is no exception as a remarkable time capsule of people’s mindset before the Special Editions and indeed the Prequels. French’s approach involves introducing claims and assertions based solely on the fact that George Lucas had time and again reflected on the gargantuan production difficulties encountered while shooting ANH, as mentioned in various articles, commentaries and interviews predating the Special Edition effort. French assumes that since the Jabba The Hutt scene has now been restored, and the Mos Eisley approach vastly enhanced (as previewed in Ben Burtt’s IMAX documentary feature Special Effects), Lucas will add the same broad brush strokes to similar problem areas. Lawrence French initially mentions the 100 effects shots that ILM worked on for ANH alone, which to him seem sufficient to anticipate a massive overhaul. He argues that the Cantina Scene ‘will […] get a complete make over’, pointing towards Lucas’ interview in Rolling Stone where he states that he ‘wanted to have horrible, crazy, really staggering monsters’. There is also mention of the Falcon’s escape having ‘more ships added to the pursuit’ and a ‘more spectacular effect for the jump to lightspeed’. French equally expects the Banthas to be globs of pixels instead of disguised elephants (CFQ, Vol. 20, No. 8, 16-17). The most radical assumption on French’s part is that the stop-motion animated game of Dejarik ‘may also be replaced by CGI’. The writer consequently insinuates that computers will wipe over the historic visual effects heritage of Star Wars. Such a thought is arguably unsettling to Phil Tippett: ‘If they replace all my stuff I won’t go see it. […] I think they started doing a lot of work on it right after we finished JURASSIC PARK’ (CFQ, Vol. 20, No. 8, p17). Alongside Dennis Muren another great visual effects visionary, Phil Tippett, the man who had tamed AT-AT walkers and Rancors at one frame at a time and then created his own creature-centric animation house which would bring to life the indigenous inhabitants of Klendatu in Paul Verhoeven’s Starship Troopers and the werefolves in the Twilight Saga. Tippett had feared in 1997 that the digital tinkering with the Original Star Wars Trilogy would wipe his tremendous legacy from history books. Considering the wealth of information on the Special Edition available at the time, the complete disregard for journalistic zest in favour of superficial sensationalism is immeasurably grating. Never mind that the tall order of shots French states will be redone for the Special Edition would vastly exceed the officially confirmed figure, or that ILMers were indeed fully aware of their cultural responsibilities – hence entirely congruent with Tippett’s sensibilities – CFQ is adamant to throttle George Lucas’ business plan whilst entirely overlooking a far more intriguing subject for discussion. The case against Lucasfilm’s Special Edition effort appeared arguably overwrought and slightly ridiculous against the background of contemporary sources which had clearly outlined the scope of the much anticipated project. The overall critique of the OT still raised the pivotal point that the original Star Wars crowd had come of age; considering the charges brought to the fore, Biodrowski and French suffered from the simple fact that the workings of late 70ies – early 80ies space epics may occasionally work as little on modern viewers as mind tricks do on Toydarians. In the world of high-stakes entertainment properties, maintaining an astute understanding of the type of target audience a company is planning and producing for is however of paramount essence. Would Lucasfilm have to brace itself for a seismic disappointment? Kenner and Lucasfilm had been reaping considerable profit from Prequel and Special Edition anticipation in the 1990ies. As far as CINEFANTASTIQUE was concerned, 1997 would mark the year this could all come to sudden halt for disregarding the Original Trilogy’s cultural legacy in favour of digital artificiality. The consumer groups a film producer wishes to court are of equal interest to tangential businesses beyond publishing, toys, games and collectibles. Franchise maintenance is above all a complex, coordinated effort that the owner normally does not shoulder alone. As film is first and foremost a communal experience, food and beverage industries have sought to bolster their revenues by tying their businesses to entertainment properties. Such cross-promotional deals create sizable leverage for the property at hand while minimising the owner’s financial risk. Not a single tentpole reaches the public without such deals, whose ubiquity belies their innate delicacy. The promoter agrees to push the property concerned at his own expense. The underlying drive to commit funds to an upcoming motion picture is the hope of attracting additional families, the key target group by a very wide margin, whose appetite might indeed prove stellar after an evening with motion picture greats. It is therefore that cross-promotional deals are commonly based on the consensus that the film itself qualifies as unwarranted family fun. This prerequisite for modern film economics to work properly even led to a precedent in 1992, which certainly did not pass unnoticed by George Lucas. The norm of contemporary pop cinema are rougher, much more uncompromising narratives, and it was Tim Burton who made older-skewing tropes and themes commercially relevant with 1989’s Batman. After comic book heroes had been reduced by the motion picture industry to colourful, pyjama-wearing eccentrics, Burton infused much of Frank Miller’s grim Dark Knight graphic novel into Warner Brother’s tentpole. It became an instant phenomenon whose product was flying off shelves as if the world depended on the man who was a bat. Needless to say, 1992’s sequel Batman Returns was highly anticipated: ‘The studio and its marketing partners face a formidable challenge. The [original] “Batman” was a milestone in entertainment licensing[, with estimated] retail sales of “Batman” merchandise at $500 million’, notes Jennifer Pendleton in her pre-release analysis ‘Manic Bat-Marketing Underway’. She argues that while there is a ‘built-in audience from the first film, [“Batman Returns’ “] success is hardly certain’. Pendleton continues that the absence of Jack Nicholson’s Joker, so instrumental to the awareness level of the first film, may prove detrimental (Variety, April 20, 1992, p3, 5). Danny DeVito would instead appear as the Penguin, redesigned for his motion picture premiere into a ghastly, fish-chomping monstrosity far removed from the cigarette-smoking Dandy seen in the comic books. Some three years and $162.8 million dollars in domestic box office later, Variety’s headline read: ‘Dark Knight Becomes ‘Bat’ Lite’. Anita M. Busch lively imagines what the pre-production meeting for the third Batman film must have been like, painting the mood ‘as dark and brooding as Gotham City during a crime spree.’ The cause for so much concern was the backlash Warner had earned from promotional partners, in particular McDonald’s Corp., which found itself inundated by harsh criticisms from parents’ groups. ‘Warner faced the terrifying prospect that its most profitable franchise […] was devolving from mainstream entertainment into a depraved cult attraction’, Busch observes and details how the ‘flamboyant’ Joel Schumacher was brought in to create what he called a ‘living comic book’. Schumacher’s easy-going persona was also put to great use to rebuild bat-confidence among promotional partners: ‘[The presentation] was lighthearted, particularly with Schumacher joking around. He said […] that it was going to be a more adventurous, entertaining Batman’, Busch reports, quoting Schumacher who ‘said there was a conscious effort “not to have kids terrified. There are villains, scary moments and violence […], but it’s comic-book violence. 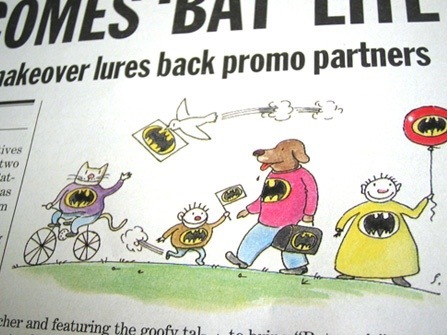 […] There’s always a dark edge to Batman [however]; it’s never going to be the Care Bears.”‘ (Variety, May 1-7, 1995, p1, 147). The third Batman garnered around $184 million in gross receipts on North American turf. Although Batman Forever bested its predecessor by only $20 million dollars, Joel Schumacher’s revision was considered a smash, having made scores of children play Batman again and hungrily flock to the nearest burger eatery. This Batman episode is historically remarkable in that an original concept, which a studio had initially backed, was eventually dismantled by the far-reaching influence of promotional coin. George Lucas understood that for a new age of Star Wars to come to fruition in full force, he depended on these food and beverage tie-ins. His Star Wars films had always been a text-book case for cross-promotion, even to the extent that, according to legend, the graphic depiction of Beru’s and Owen’s grisly deaths was deliberately kept in the film to avoid a “G”-rating from the MPAA. Lucas still took the opportunity the impending Special Edition release provided to put significant emphasis on the fact that the new Star Wars films would contain more humour. Some of that newly-found light-heartedness was self-evident in the spectacular Special Edition trailer: in one of the refurbished scenes, a reckless driver of the aforementioned swoop-bike rousts a ronto in Mos Eisley, throwing two digital Jawas tumbling down the beast of burden’s back – children were as pleased as Pepsi Company management, which had shelled out more than $150 million dollars for a promotional deal covering all three Special Edition re-issues. As industry mavens proficiently targeted families and their children, Lucasfilm had already spent several years observing a new phenomenon and its energetic proponents. Fan interest increasingly spilled over to the then still fledgling World Wide Web, giving the information network its first full-scale motion picture marketing sensation. Over 350 fan-made websites were reported by George Lucas’ company towards the end of 1996. Considering the enormous potential among tech-savvy teenagers and college students, Lucasfilm delivered its final master stroke to achieve complete market awareness: the official website www.starwars.com launched in November 1996, coinciding with the wide release of the sensationally popular teaser trailer. The website therefore centred on a countdown to the Star Wars Special Edition Trilogy release date. Content was comparatively sparse by today’s standards, but effective, highlighting key locations and characters of the saga to allow for some exploration into the myth of George Lucas’ creation: ‘Just as Star Wars grew, or rather exploded, into the public consciousness 20 years ago, this Web site will continue to grow and change. And like the films, our aim is to inform, entertain, surprise, and amuse you. We’ll all have some fun, and we promise to provide the most up-to-date information (and shoot down inaccurate rumors) on the Star Wars galaxy’ (StarWars.com, April 18th, 1997). 20th Century Fox made its own sizable contribution near the conclusion of its superb teaser campaign when it confidently pencilled in an unheard-of 1,850 to 2,000 screens in North America for the reissue of a twenty-year old film. ‘The beauty of marketing ‘Star Wars’ is that everybody knows the story […]. All you need to do is let them know it’s coming. It’s not about selling the movie’, Sherak briskly conjectured. Exhibitors from around the world were quick to agree as people returned to cinemas only to see the Special Edition trailers: ‘”We simply can’t wait,” says Howard Lichtman, exec VP of marketing and communications at Cineplex Odeon. Inventing a new word to describe his enthusiasm, Lichtman say “we think it’s going to be absolutely gi-normous for us”‘(Variety, November 11 – 17, 1996, p76). When the groundswell in Star Wars frenzy overwhelmed the public, ILM headquarters had become the brightest centre in the universe in its busiest year so far. George Lucas’ capable team cooked the odd CPU or two adding crucial shades of wizardry to a creative palette that, one day, would be passed over to the bearded one, thus whetting people’s appetite for Star Wars by proxy. One notable client was Tom Cruise and his fresh Cruise-Wagner production shingle. The maverick entrepreneur and cinema icon is known to insist on industry’s finest to embellish his work. George Lucas’ pal Brian De Palma helmed the big screen adaptation of Mission: Impossible, whose world of espionage was outfitted with the kind of super-reality only ILM could deliver. Mission: Impossible’s was significant because its effects were laboriously pre-visualised after Lucas’ still ongoing work on the Star Wars re-release proved this approach indispensable for efficient post-production. Furthermore, and much more importantly, Brian De Palma’s film made much of then still largely experimental virtual environments. Coming straight off the Special Edition project, John Knoll supervised this effects-heavy finale of Brian de Palma’s 1996 Mission Impossible involving CGI trains, helicopters and the Chunnel. Click for video clip on You Tube. A mere two years after lending Keanu Reeves some Speed to his rise to stardom, former cinematographer Jan De Bont (he lensed for instance Renny Harlin’s Die Hard 2 in 1990, also an ILM project) demanded of ILM nauseating real-weather effects with a mind of their very own in the exhilarating rollercoaster ride of a film, Twister. The blockbuster starring Helen Hunt and Bill Paxton was a labour of love for ILM, which invented complex particle systems that form the foundation of many effects shots to this day. Taking the level of creature animation to new heights, Dragonheart from director Rob Cohen teamed Dennis Quaid with a very special Sean Connery, who gave a wonderful vocal performance for the magnificent creation that is ILM’s Draco, the last of the dragons. Scott Squires, one of the three supervisors that would soon enhance the visuals of the first prequel, held the reigns of the digital dragon. ILM developed a groundbreaking software Caricature to enliven the magnificent creature more realistically. From now on, animators could animate their creations in low-resolution renditions – rather than as simple wire-frames – so they could much better judge the interaction between live action plates and the CGI character. Former graphics supervisor on Jumanjii Jimmy Mitchell used Caricature to full advantage in Tim Burton’s underrated Mars Attacks!. The world’s first CGI ensemble cast of alien invaders featured digital clothing, acting, comic timing and expressivity that left 1995’s Casper far behind: Quick, progress has become. Tim Burton’s film translation of Topp’s bubble gum card series Mars Attacks! showed off increasingly detailed and sophisticated character animation by Industrial Light and Magic. Click for video clip on You Tube. Lastly, that infamous scourge of Starfleet, John Knoll, wasted an entire armada of Federation starships in the explosive opening moments of Jonathan Frakes’ Star Trek: First Contact. 1996 was a busy year for John Knoll: having finished the ANH Special Edition, and Paramount’s Mission Impossible, he created the astonishing visual effects for Johnathan Frakes’ Star Trek: First Contact. Clearly, the world was anticipating this and then some for the upcoming Prequel Trilogy. …that, truth be told, were no longer so far off anymore as the eventful year of 1996 finally drew to a close. The return of Star Wars to the public consciousness was exemplary. The fine execution of well-considered plans fermented on the principles of patience remarkably afforded people of all ages an elating sense of (re-)discovery. The key was not to convince audiences with brute force that these films were the best kind of entertainment they would ever see, as CFQ suggested, but to let them realise that the big silver screen was by far the best way to go experience Star Wars. More importantly, the teaser itself was treated as a stand-alone event, a rarefied clip that people started to talk about out of their own volition, based on their enthusiastic reception of wonderful glimpses from outer space. The impeccable decency of an easeful viral campaign eventually paid off huge dividends on November 22nd, 1996, when 20th Century Fox long at last started the full-scale promotional push with the wide release of the Special Edition trailer, posters and standees. Although George Lucas’ Special Edition was already universally known, it was wonderfully fresh because the world at large was still to experience it with its own eyes. All Lucasfilm had to ensure were product availability and a busy pipeline for the months and years to follow: ‘No matter how much marketing dollars you spend’, asserts J.C. Penney national publicity manager Carol Edwards, ‘success comes from the consumer wanting it’ (Variety, April 20, 1992, p5). Before year’s end, experts’ estimates put the possible final tally for the ANH re-issue at ‘anywhere from $25 million to $50 million or more, with the sequels each taking in about half as much’ (Variety, November 11 – 17, 1996, p76) – Steve Biodrowski’s and Lawrence French’s tickets not included.